So your little tyke is artistic! The next important question now is: how do you help your child grow to his full potential as an artist—without neglecting other areas so that he gets a balanced development? 1. Be there for your child. Nothing beats showing your love by happily showing up for his recitals, lessons, or exhibitions. It’s important to let your artistic child know and feel you are interested in his development, and in getting to know how talented he is. And what if you dont’t have the same talent or the same artistic temperament as your child? Try your best to study your child’s favorite art with him, at least enough for you to fully appreciate what potential he has, and your own child’s efforts to grow his skills. Try to introduce your child to as many art forms as possible. Children can be fickle and may switch from art form to art form, before settling down with one. Some of them may be talented and energetic enough for two or more. dont’t stick to simply introducing your child to the “kiddie” version of various arts. Let him see what art can really be like when made by adults. Choose your art examples carefully, and limit them to standard classics and “parental guidance” pieces. 3. Give discipline and praise. Praise and discipline should go hand in hand, especially with artistically-inclined kids. You need to affirm your child’s talent and potential; praise and love him for every effort he makes to improve his artistic skill. But at the same time, you need to inspire and lovingly push your child to try better. You also need to establish good working and thinking habits for him, both for his artistic hobby as well as for his homework. Discipline and focus are required even for intuitive and artistic work. 4. Provide the right artistic training and tools. Your child’s chosen art may require special lessons, instruments, clothes, materials, etc. Choose the best teachers you can afford and trust. Invest in all of these, for this is a crucial part of your kid’s childhood and development as a person and as an artist. Every person needs a practical and well-rounded education, and that includes artists. Some artistic kids excel in other subjects, even math and science. 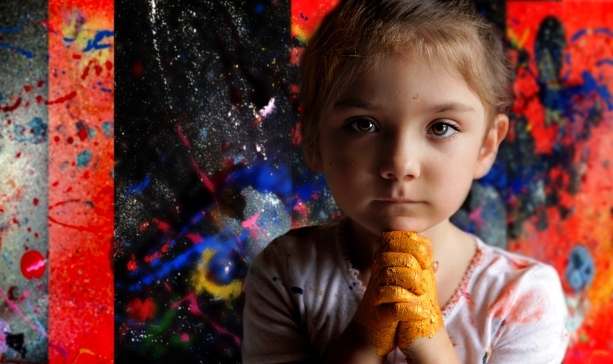 Most artistic kids, however, tend to be a little weak in math and science if their natural skills and interest are in the arts and intuitive thinking. You need to find ways to strengthen your artistic child’s weaker learning areas. Hire a tutor, or try to tutor him yourself. Use your imaginative and artistic ways in teaching him analytical concepts he may have difficulty grasping; be patient and persistent. 6. dont’t neglect emotional intelligence (EQ). Artistic children tend to be emotional and sensitive. So teach your child how to deal with frustration, pain, or anger. Teach him how to forgive himself and others of past failures, and how to try again. And are you spiritual or religious? The best way of fostering EQ is to foster hope and faith in a child. A deep spirituality, when taught early on to an artistic child, becomes his bedrock of strength and emotional intelligence all the way to adulthood.